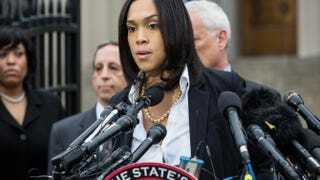 Baltimore City State’s Attorney Marilyn J. Mosby announces on May 1, 2015, in Baltimore that criminal charges will be filed against Baltimore police officers in the death of Freddie Gray, who died in police custody a week after being arrested April 12, 2015. If you’ve become enamored in recent weeks with the work of Baltimore City State’s Attorney Marilyn Mosby and, by association, her husband, City Councilman Nick Mosby, since the indictments of six police officers in the death of Freddie Gray, then you’re about to see a little bit more of them both. But not in the courthouse or the council chambers. Instead, it’ll be at the circus. Both will be guest ringmasters at an upcoming performance of the traveling black circus on Friday. Is it simply bad timing or another inappropriate move in the limelight for the country’s youngest state’s attorney? Responses on social media varied. @SunnyHostin Probably not the smartest thing to do right now? This comes on the heels of Marilyn Mosby’s appearance onstage with music legend Prince for his #Rally4Peace concert, which drew criticism a few weeks ago. She is also being accused of bias by pro-law-enforcement critics for her close ties to the community. But the real issue is, what’s appropriate and what’s not appropriate in the lead-up to prosecuting a high-profile case of police brutality? What's appropriate regarding a case that spawned nationwide protests and several days of civil unrest? According to the councilman’s office, Nick Mosby and his wife, Marilyn, were invited to be special guests of the UniverSoul Circus prior to Gray’s death. It was “in the works way back,” Candance Green, Councilman Mosby’s press liaison, told The Root. And inviting community leaders to be guest ringmasters is nothing new for the community-focused UniverSoul Circus, which enlists local figures to be part of the show. Its current show has the theme “Your Life Matters,” intentionally or unintentionally mirroring the #BlackLivesMatter movement. Whether or not the Mosbys want to be on the nation’s radar, they are. The death of Gray and the subsequent call for justice nationwide—along with the stirring news conference at which the take-charge attorney announced the arrests of Baltimore’s six officers—have ensured that. With this attention, however, comes judgment, and social media is already buzzing about this upcoming circus appearance. First Marilyn Mosby was slammed for her Prince-show appearance, her detractors calling it biased and unprofessional. But the concert was a call for togetherness. You could argue that her presence onstage was benign enough. Then someone unearthed an appearance she made on Judge Judy in which she handily won a case against a neighbor. Again, this was also benign. It happened more than 15 years ago. Not a big deal. One could even argue that it was a fun tidbit about a fascinating woman. But even though Mosby and her husband were invited to appear as guest ringmasters prior to the death of Gray, the indictment of six officers for his killing, and the subsequent unrest and protests that filled the city, let’s face it: It doesn’t look good. Honors and appearances should come after the battle is won. Whether or not any of those six officers charged will actually spend time inside a prison cell is still unknown. Maybe after this, the Mosbys ought to sit out their next public engagement or invitation—if not for the sake of justice, then maybe for the sake of their own reputations. No one can judge what is in the Mosbys’ hearts—they have both come across as serious about getting justice for Gray—but the public can be harsh if the celebration seems premature.